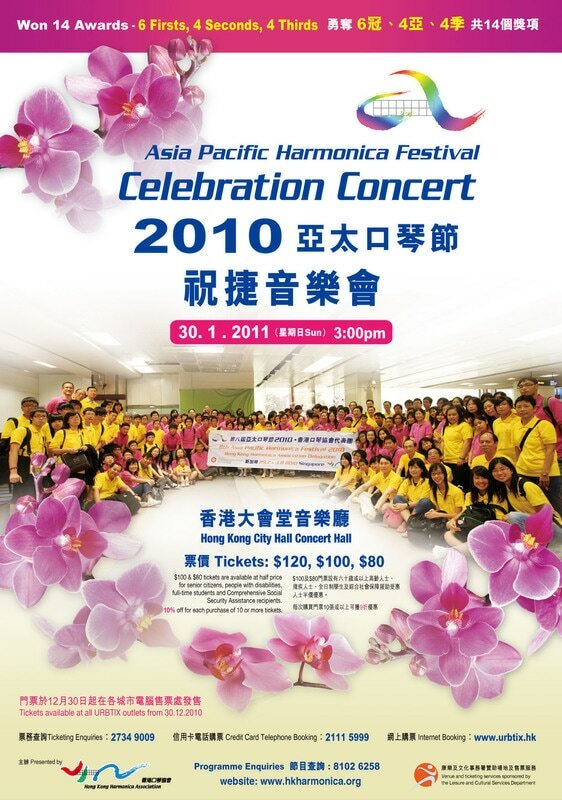 Hong Kong Harmonica Association led a 160-person delegation to participate in the Asia Pacific Harmonica Festival (APHF) held in Singapore from 29 July to 3 August 2010. This biennial prestigious event attracted more than two thousand participants, which was largest in scale when compared to other previous APHFs. In addition to participating countries like China, Japan, Malaysia, South Korea, Singapore and Taiwan, this was the first time we had participants from India and Thailand. The wonderful program for five days, including the seminars, concerts, competitions and workshops, provided a platform for harmonica players and performers to share the joy together. This year, HKHA Harmonica Orchestra was invited to perform in the world famous Esplanade Concert Hall as a prelude to the Festival and received a big round of applause from audience. Delegates of the Hong Kong Harmonica Association altogether won a total of 14 awards, including 6 Champions, 4 First runners-up and 4 Second runners-up. It was commendable as we had award-winning delegates from all categories (Youth, Open and Senior) this year. In this celebration concert, we will do our very best to bring you a fantastic afternoon of harmonica music. 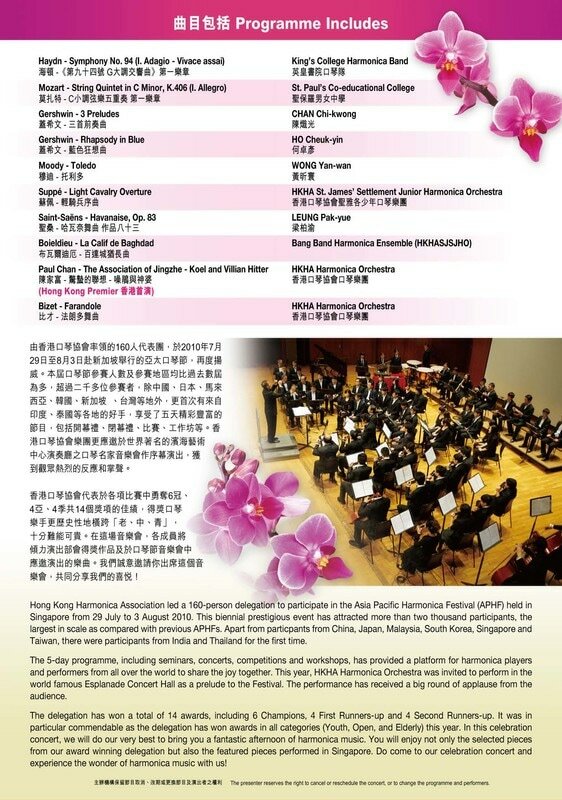 You will enjoy not only selections from the award winning pieces but also the featured pieces performed in Singapore. Do come to our celebration concert and experience the wonder of harmonica music with us!